Pulling together bits from a number of sources, I've come up with my first task management tool. It's a slight enhancement to AutoFocus - not in terms of method but rather in format. That is, one thing I've noticed about AF is that little is said about how to arrange things on the page; I've come up with one possibility in that regard. Here's an image showing a page written up in my format. The goal was to balance the utility gained by adding structure to the page against the extra work needed to add and maintain that structure. I'm using a simple spiral bound, quad-ruled notebook here. This image only includes sample notes and tasks because the real pages in my notebook all have private information. First thing I do when I start a page is draw in a rather wide left margin. The margin is used to basically "tag" entries with keywords and a few other things. The margin can be thought of as for "meta data" about a task. Next I put today's date at the top of the body of the page. 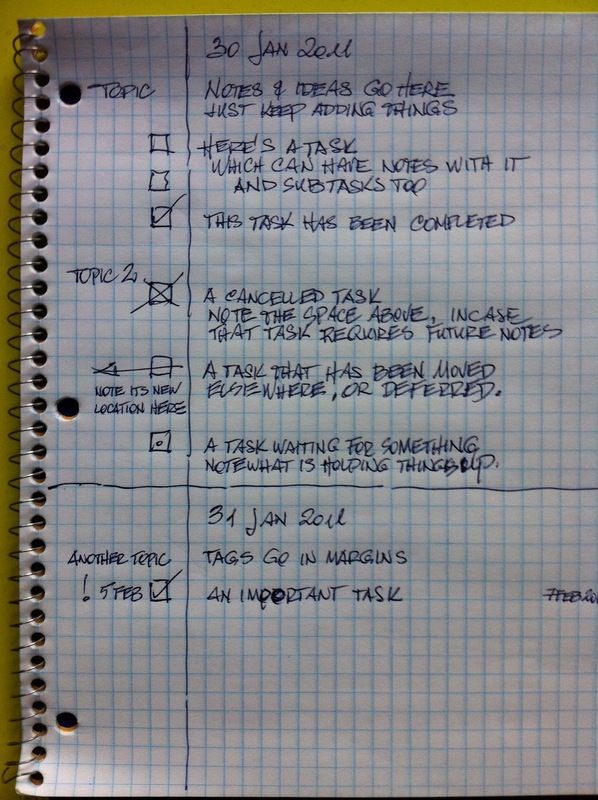 Entries come in two basic types: notes and tasks. Notes are for things like meetings, and generally writing down ideas, rather than actions I need to take. Notes are distinguished by their general topic. I put the topic in the margin, to mark the beginning of a new "chunk," then just write out the notes. Sometimes a note might be just one or two lines long; other times it might be several pages long and have a variety of tasks embedded in it. This is one particular advantage, I think, of this format: since notes and tasks are kept together, you can put pretty much anything at all into a single notebook. Having everything in one place is a big deal for me; no more multiple booklets and scraps of paper in jacket pockets. Blank lines are your friend here. A simple spiral bound notebook can cost less than $2, so there's no reason to be stingy with space. Vertical space is important to clearly mark boundaries between items and to make sure you leave space for annotations you may add to items in the future. And if you're worried about the environment, then you shouldn't be using a paper notebook at all. But that's another post too. Tasks are marked by a small box in the margin. The box is useful because it not only lets you separate tasks from notes very easily, but it's also an anchor for other bits of task meta-data. Completed tasks get a checkmark in their boxes. Cancelled tasks get an X. Delegated tasks are marked with a left-pointing arrow through the box. Optionally, you may want to put a marginal note indicating the reason for delegation. I don't, but it might help you. Finally, if a task is hung waiting on something, then I put a small circle in the box - small enough to be plainly visible if the box is empty, and yet vanish pretty much completely if I put a check, or an X, or an arrow through the box later. The very last task on the sample page shows a task marked as important (the exclamation mark at the left side of the margin), and having a due date (the date between the box and the exclamation mark), and a completion date ('way over on the right side of the page). I like the idea of having the dates at either end of the task, representing a span of time as it were. It also makes sure I don't confuse due dates with completion dates. You can use any variation of AF with this format. That is, the format lets you keep the information you write a little more organized just by the way it's put on a page, while AF in any of its forms helps you sort through the actual tasks and get them done. I note that if you prefer other forms of paper notery for this format, you do have some choices. Circa makes some very interesting notebooks - which I also use. The beauty of the Circa notebooks is that you can rearrange the pages as in a binder, but also fold the cover back on itself as with a spiral-bound notebook. You can buy pages for Circa that are either plain grid paper or pre-printed to have a large left margin, special locations for dates, and so on. Or you can buy a Circa hole-punch and use whatever kind of paper you like. Circa notebooks work well and look better than the goofy spiral-bound notebooks. I like their touch of class. There are other manufacturers of disk-bound notebooks like Circa (I mention a number of them here), but I haven't looked into the kinds of pre-printed pages they have and how that might impact the format I propose here. So there you have it: a simple way to organize content on a page to help you use AutoFocus. It works great for me; your mileage may vary. If you're interested in how this format came about, here's the short version: I read an article by Mark Forster for lifehacker.com where he mentioned how nice it would be to have both notes and tasks in a single notebook. At the same time I was playing around with orgmode, an editing plugin for the Emacs text editor that does just that: combining journaling and note-taking with appointment and task management. These two things, plus the notebook I keep on my desk at home, just kind of merged one day. And out popped this format. I've been using it ever since. Indeed, I'm even thinking of hacking orgmode to support my page format.